Installation views of Sarah Miska: ImPRESSIONS, Hernando’s Hideaway, Miami Beach, January 26–March 30, 2019. HERNANDO’S HIDEAWAY IS PLEASED TO PRESENT THE WORK OF SARAH MISKA IN HER EXHIBITION IMPRESSIONS. THE SHOW BEGINS WITH SCULPTURES OF FINGERS THAT TAKE THE SHAPE OF ABSTRACTED FLAMINGOS SPECKLED ACROSS THE FRONT LAWN. IN THE GARAGE GALLERY, TWO WHIMSICAL, ANTHROPOMORPHIZED FAINTING COUCHES CROUCH AND SLINK ON THE GALLERY FLOOR, WHILE BACKLIT HANDS DIRECT THE VIEWER THIS WAY AND THAT. MADE SPECIFICALLY FOR HERNANDO’S HIDEAWAY, MISKA’S WORK CONTINUES TO ADDRESS THE BODY AS A SUBJECT BY WAY OF COMPARTMENTALIZATION AND SEGMENTATION, AND RECONFIGURES TRADITIONAL IDEAS OF LEISURE THROUGH DISTORTION. 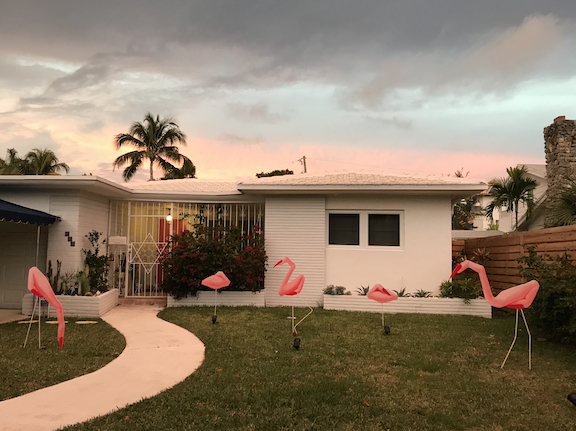 IN RELATIONSHIP TO THE DOMESTIC SPACE OF THE HERNANDO RESIDENCE WHERE FLAMINGOS DECORATE A ROOM OR THE GARDEN, MISKA’S LAWN PIECES SEEMINGLY MOCK THE KITSCHY EXISTENCE OF THESE OBJECTS AS DECORATION. HER AWKWARDLY-SIZED, LENGTHENED FURNISHINGS ARE VIRTUALLY IMPOSSIBLE TO LAY UPON, YET THEY REMAIN A SEMI-FUNCTIONAL PLACE FOR A WEARY HEAD. MISKA TRANSFORMS THE GALLERY INTO A SETTING THAT CREATES THE ILLUSION OF CONTEMPLATION AND RELAXATION WITH AN UNCERTAIN STRANGENESS. SHE INVENTS WHAT BAUDELAIRE CALLS “A ROOM WHICH RESEMBLES A DAY-DREAM,” (“THE DOUBLE ROOM”), WHERE EVERY SCULPTURE IS AN ABSTRACTED HAND; A HAND BECOMES A FLAMINGO, A HAND BECOMES A CHAIR, OR A HAND STANDS IN FOR THE LETTERS OF AN EXIT SIGN. 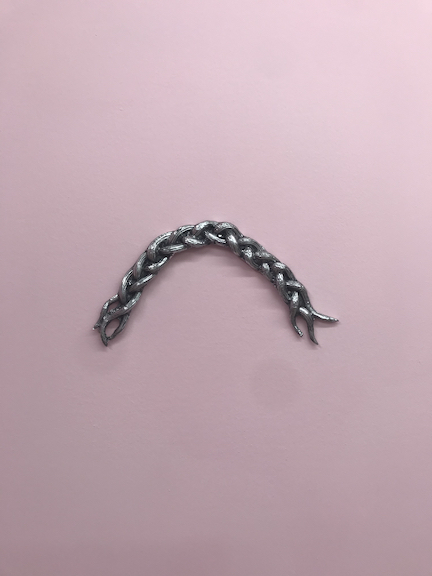 IT IS THROUGH THESE UNCANNY IMPRESSIONS THAT MISKA MAKES VISIBLE THE POP LIFE OF OBJECTS AFTER THEIR ABSORPTION INTO CULTURE BY TRADITION AND REPRESENTATION. SARAH MISKA (B. 1983, LIVES AND WORKS IN LOS ANGELES, CA) RECEIVED HER MFA FROM ART CENTER COLLEGE OF DESIGN IN 2014. SHE RECENTLY HELD A SOLO EXHIBITION TITLED SNAP AT GRIFFFF’S IN MILWAUKEE, WISCONSIN IN 2018. SHE HAS PARTICIPATED IN SEVERAL GROUP EXHIBITIONS INCLUDING: WE GATHER HERE TODAY, CURATED BY LAUREN FEJARANG, DREAD LOUNGE, LOS ANGELES, (2019); TENDER ARRANGEMENTS, SUPER DUCHESS, NEW YORK, (2018); CHRONO RIFT, DREAD LOUNGE, CURATED BY LAUREN FEJARANG, LOS ANGELES, (2017); SUMMER OF LOVE, ORGANIZED BY JUSTIN CAVIN, WILDING CAN, LOS ANGELES, (2017); IS IT IN THE MIDDLE, CURATED BY CIMA RAHMANKHAH, MIM GALLERY, LOS ANGELES, (2016); AND KEEP IN TOUCH, WIGHT ART GALLERY, UCLA, LOS ANGELES, (2014).